Helical A Series Flexible Aluminum Couplings meet performance demands over a wide range of applications, including drive systems for encoders, instrumentation, lead screws, small pumps, feed rollers and anywhere a light to medium duty, torsionally Flexible Aluminum coupling is required. 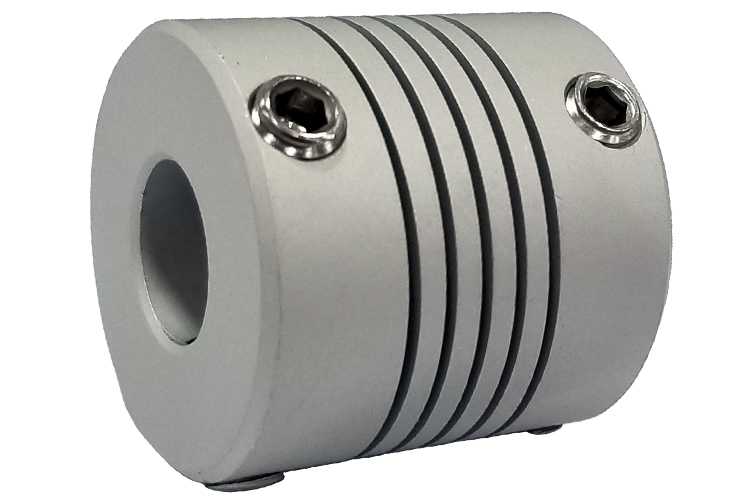 Helical A Series Flexible Aluminum Couplings is Helical's most popular coupling due to an array of options, in a variety of diameter sizes, that allows you to tailor the A Series to your specific applications. Helical A Series Flexible Aluminum Couplings are available in a 7075-T6 Aluminum Alloy material and with a Set Screw attachment. A1 Seating Torque : 4.3lb/in. A1 Center Line (Inch): .07in. A2 Center Line (inch): .07in. Torsional Rate: 0.66 degree/lb in. The Helical AR062-5-5 Flexible Aluminum Coupling, A Series is one of thousands of quality tooling products available from MRO Tools. Please browse Helical Flexible Aluminum Set Screw Couplings, A Series for tools similar to the Helical AR062-5-5 Flexible Aluminum Coupling, A Series. Helical AR062-5-5 Flexible Aluminum Coupling, A Series description summary: Helical Flexible Aluminum Couplings, A Series. Outside Diameter: 0.625'' Length: 0.62'' Major Bore Diameter: 0.157'' Minor Bore Diameter: 0.157'' Momentary Dynamic Torque: 6.7lb/in Angular Misalignment: 5 deg Parallel Offset: .010'' Quantity discounts may be available for the Helical AR062-5-5 Flexible Aluminum Coupling, A Series. Please contact MRO Tools for details.